ATTENTION- PLEASE NOTE: Due to a sitewide security update, ALL PASSWORDS assigned before 3-15-18 no longer work. See the information below to learn how to get your replacement password. Did you see a product on our site that has a Bonus Video button, and you want to watch the video? First you have to purchase the trick from MagicTricks.com. The online Bonus Videos are filmed by Peter Monticup, exclusively for his customers who bought the trick. Getting extra stuff like the Bonus Videos are why you should buy from us! Your password will be mailed with your trick. 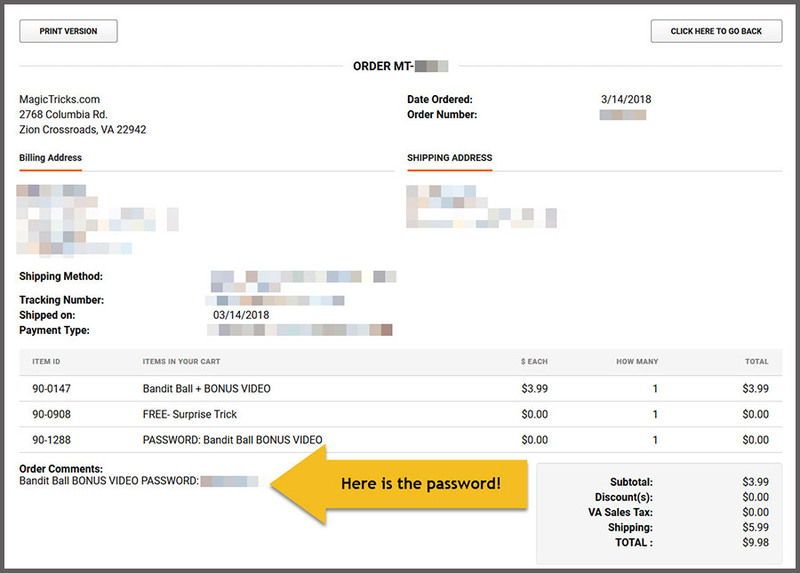 When you buy a trick that comes with a Bonus video, the password for that trick's Bonus Video will be printed on your receipt, shipped to you in the same package as your trick. Please look on your receipt for the password. The password will be printed in the "Order Comments" section of the receipt. Sorry, only customers who purchase the trick from us will get the password to the Bonus Video. If you already purchased the trick, and your password no longer works, see how to get your replacement password. METHOD #1- Please look on your receipt for the password. METHOD #2- You can look at your orders in your account. You are able to see a list of all the orders you have placed at MagicTricks.com. If an order contains a BONUS VIDEO, the password for that video will be printed in the Order Summary for that order. On the My Account page, find the "Track Your Recent Orders" section. 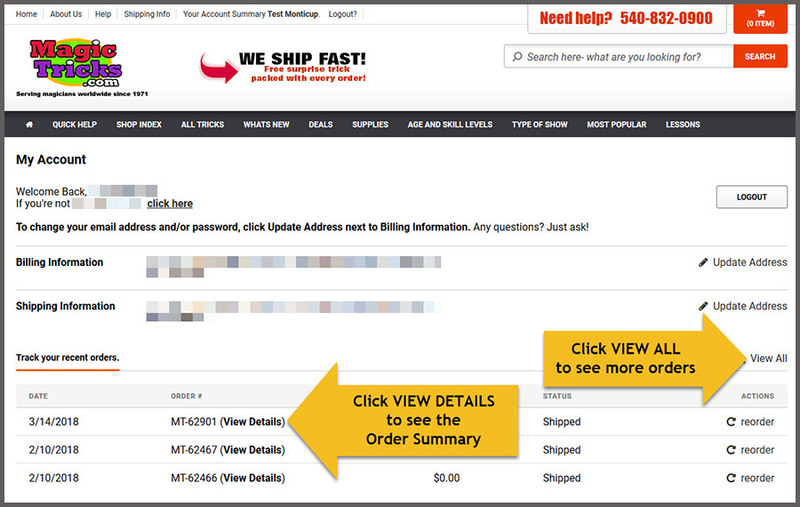 Click on "VIEW DETAILS" next to any order number to open the Order Summary. Look in the "Comments" section of the Order Summary for the Bonus Video password. METHOD #3- Contact us for assistance. To obtain the password for your Bonus Video, please contact us using the CONTACT FORM. We apologize for any inconvenience, and we will answer your request ASAP. Unfortunately, the password you were given when you purchased the trick WILL NO LONGER WORK. Due to a site security upgrade on 3-15-18, all Bonus Video passwords had to be changed to a letter-number combination. You will be sent the password for the video in the package with your trick. Please look in the "Order Comments" section on your receipt for the password. When you have your password, go to the product page on MagicTricks.com for your item. Click on the Watch Video red arrow, located right under the big demo video. Put your password in the Password box and click the "Enter" button.